We love fruitcake at my house. And this is a great example of the goodness that can come from following the instructions on a packet. I bought a 32oz (2 lb) container of Sunripe Fruit Cake Mix and used — more or less — the recipe on the label. Okay, so I was like, “You’ve got to be kidding me.” So I used ALL the fruitcake mix and NO pineapple, apple, or cherries. 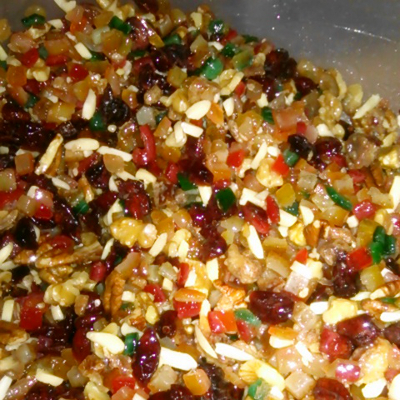 I had no currants, so I used some raisins and some dried cranberries. Measure remaining ingredients into large mixing bowl. Beat at low speed until blended; beat at high speed 3 minutes, scraping bowl occasionally. Stir in fruit mixture. Spread mixture evenly in greased 12-cup fluted or angel cake pan, or 2 greased 6-cup fluted cake pans. Press mixture firmly into pan. Bake in pre-heated 250-degree (F) oven until toothpick inserted in center of cake comes out clean, 3 to 3/12 hours. Cool in pan on wire rack 20 minutes; invert onto wire rack and cool completely. Garnish with whole cherries, pineapple and nuts. I followed this part exactly, except I didn’t garnish it with fruit, I garnished it with bourbon. I used an angel cake pan to cook it. When I took it out, I sprinkled it with a couple or three tablespoons of bourbon. After it cooled, I had to run a knife around the edges to loosen it, but it came right out. Then I sprinkled some more bourbon on it. It’s actually a bit darker than this, but the flash got all flashy with it. Honestly, the best damn fruitcake I ever put in my mouth, and I looooooooooves me some fruitcake! And now, for your seasonal enjoyment, this, because it doth have fruitcake in it. A WRITING PROMPT FOR YOU: What does your main character love that is generally laughed at as detestable? This entry was posted in Food. Tagged Christmas, holiday, recipe. Ha! Another hilarious science fictional post. HA HA. Somebody likes fruit cake!! Har har. You’re a laff riot, grll! 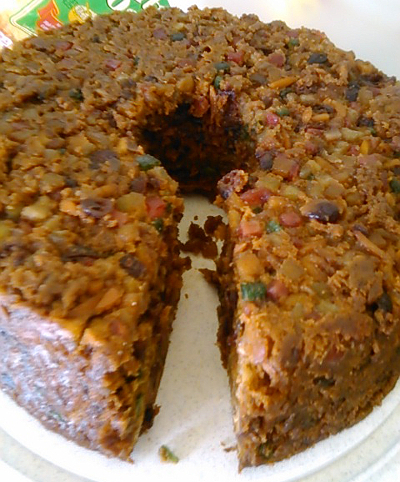 Joking aside, this recipe (and the photo) looks like FOOD, not fruit cake. AND it has the advantage of having a known creation date! I got my package, fruitcake and all. Deelicious! I especially like the citrous undertone to every bite! BTW, the bourbon balls are scrumptious. Jim likes them, too. “Well, I’ll Just have one more,” quoth he. Yay back! Glad you like it, and that the nutty bits aren’t too bitty for Jim.